The pale field-rat Rattus tunneyi is one of seven species of native Rattus occurring on the Australian mainland. The species now occurs principally in native tussock grassland habitats in tropical and sub-tropical Australia, having declined from > 85% of its former range. Historic and sub-fossil records suggests that it once occurred through much of arid and semi-arid Australia, but it is now largely absent from these biomes. One exception to the species’ widespread decline in arid and semi-arid Australia is a small remnant population detected at Edel Land on the southern shore of Shark Bay in Western Australia in the 1960s and 1970s. WR&M is working with Murdoch University PhD student Sally O’Neill to establish the distribution, habitat preferences, and dynamics of the species at Shark Bay. Short, J., O'Neill, S., and Richards, J.D. (2018). 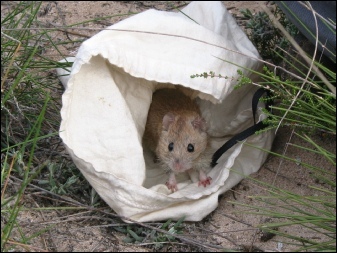 Irruption and collapse of a population of pale field-rat Rattus tunneyi at Heirisson Prong, Shark Bay, Western Australia. Australian Mammalogy 40, 36-46.